Ever since traveling vendors sold their wares in towns and villages, marketing has affected the choices people make; and, sometimes, it's hard to say whether those choices are ultimately in the best interests of the consumer. That end result bears considering, says Nichole Kelly. She's the chief consciousness officer at Conscious Marketing Institute and author of the book How to Measure Social Media: A Step-by-Step Guide to Developing and Assessing Social Media ROI. Previously, Nichole was CEO of Social Media Explorer, where she grew the agency side of the business to multimillion-dollar revenue in 18 months. Previously, she held in-house marketing roles, including at Sherwin-Williams. After a health crisis prompted Nichole to re-examine her life and career, she began considering questions like "what's my true purpose?" Bearing in mind the role marketers play in getting our target audiences to take specific actions, she saw her role in business in a new light, and began to see the responsibility that marketers bear to consider whether completing our calls to action ultimately helps consumers. I invited Nichole to Marketing Smarts to discuss "conscious marketing" and the idea that we marketers have a responsibility to the audiences we serve to be transparent about the data we collect and the ways we use it, and to be more mindful of the impact our marketing programs have on our target audiences. Traditional marketing sometimes made people people feel incomplete so they would buy the product, but conscious marketing makes people feel better about themselves (03:55): "For me, conscious marketing means marketing with the intention of raising the vibration of our planet and, essentially, how people feel. As marketers, we are the message and we set a lot of standards that dictate how people feel about themselves, how they feel about their families, their jobs, all of these things. When you're marketing consciously, the intent, ultimately, is that after someone has seen your advertisement or seen your email...they feel better about themselves or about their position in the world than they did when they started." Consider how consumers would feel if they saw their data in your CRM database (04:44): "With this conversation about Cambridge Analytica, it's opened the door for consumers to start to become more aware of where they've been sharing their information. Right now, the conversation is very focused on what Cambridge Analytica has done, and I would say this: As marketers, we all know that we have used consumer data. We've targeted consumers on ad platforms. We've merged contact records from multiple data sources into our databases, we've monitored where consumers go on our websites, down to search terms and all of these things. So while, right now, the conversation is on what Cambridge Analytica did in terms of selling that data to someone else, really this is something that was available at the time in the platform that Facebook made available. "The question starts to come in of not what we can do, but what we should do. As I look at what happened with this data and I really started to take a look at what is in the consumers' best interest and what do consumers truly understand about the data that we're collecting...if they did know, would it increase their trust or would it decrease their trust in us? I would have to say that most consumers, if they saw their contact record in our marketing automation system or our CRM, would be appalled at the level of data that we have on them, and that means it's time for us to re-evaluate what we're doing." Don't use any data for targeting that would be illegal to consider in the hiring process for a new employee (09:48): "One of the top questions I ask myself is, 'If I were to use this information to target somebody for employment, would it be legal or not?' When you start to look at how the employment laws are set up, we can't target employees based on gender, race, sexual orientation, income, ZIP code. All of these key factors that we use for advertising, it's illegal to target someone for employment based on that. "If you start to apply similar parameters to your marketing campaigns and say, 'OK, look, we know we have access to the data, we know we can get all of this data from Facebook, and Twitter, and all these different social and search platforms. However, what we're gonna do is, instead of targeting based on who we are being told you are, we're going to start targeting based on what it is you want to experience.' That starts to become a combination of more interest-focused targeting versus demographic and socioeconomic-status targeting." Ask yourself whether what you're marketing help humanity to thrive (13:40): "Marketers tend to set trends. For the last hundred years, marketers have decided what we wear, what we think, and what's acceptable in society. And for the first time, at least since I've been alive...I'm seeing consumers really be ahead of the marketing community. You have conscious consumers that are saying 'we want to work with companies that are giving back, that are building sustainable products, that aren't hurting the environment'; you have conscious businesses who are coming out, these mission-driven businesses that not only sell a product, but are having an impact on the world and humanity. "But we don't have a group of conscious marketers saying 'hey, we've actually sat down and thought about how we're giving back, and how what we're doing impacts society as a whole, how it impacts the planet.' We're just a little behind in that. We're still marketing sugary sodas and processed foods to consumers despite decades of research that show that these foods and these products are not helping humanity thrive. If you start to look at it from the word 'thrive' versus 'survive,' and where you're having an impact, it starts to get super interesting." Register here for the course. Nichole and I talked about much more, including how to raise consciousness at your marketing organization, how Millennials are impacting marketing, and Nichole's advice for today's marketers, so be sure to listen to the entire show, which you can do above, or download the mp3 and listen at your convenience. Of course, you can also subscribe to the Marketing Smarts podcast in iTunes or via RSS and never miss an episode! 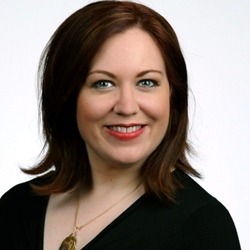 Marketing expert Nichole Kelly, chief consciousness officer at Conscious Marketing Institute and author of How to Measure Social Media: A Step-By-Step Guide to Developing and Assessing Social Media ROI. Follow Nichole on Twitter: @Nichole_Kelly.